A couple of weeks ago I introduced a new ‘Glitz and Glamour’ category to my doll clothes patterns with the release of my 18” Doll Clothes Wedding Dress Pattern. At the time I promised that I would also have this pattern available for the 18 ½” Cabbage Patch Dolls ‘sew’ I’m thrilled to be releasing that Wedding Dress doll clothes pattern today! 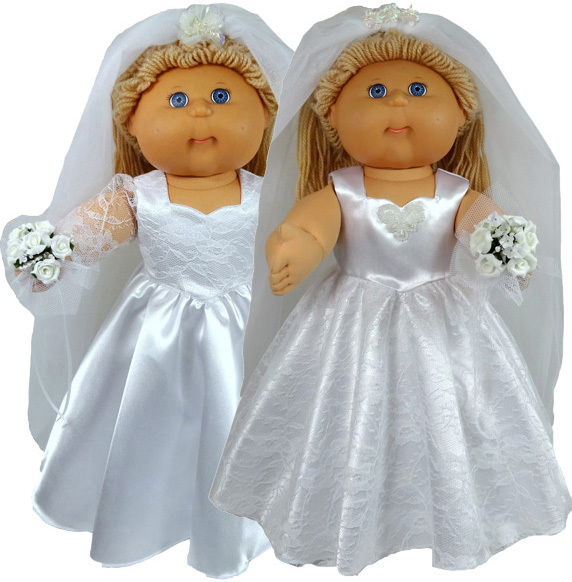 Cabbage Patch dolls make beautiful brides too and so now they have a choice between two gorgeous different wedding dresses. The first option has lace overlay on the bodice and delicate lace sleeves while the second option is sleeveless and has stunning lace overlay on a very full skirt. If you can’t decide which one you like best, why not make one in white for the bride and one in your favorite color for the bridesmaid! Also included with my Wedding Dress Pattern are patterns for a petticoat, which helps to give fullness to the skirt, and a beautiful full length wedding veil. ‘Sew’ what are you waiting for? Purchase this gorgeous wedding dress doll clothes pattern today and your 18 ½” Cabbage Patch doll will be walking down the aisle in no time at all!